You’ll notice there’s some ingredients here that are on some lists as high histamine. I talk quite a bit about how abandoning the low histamine/histamine intolerance diet is what I believe is helping me heal. But that doesn’t mean I’ve thrown all caution to the wind and am permanently out to lunch at Taco Bell. I’m just eating a high nutrient histamine-balanced diet with lots of antihistamine and anti-inflammatory healing herbs for my twin diagnoses of histamine intolerance and mast cell activation. How can I be diagnosed with both? Check out my post on diagnosing histamine disorders (histamine intolerance, mast cell activation disorder, mastocytosis) here. 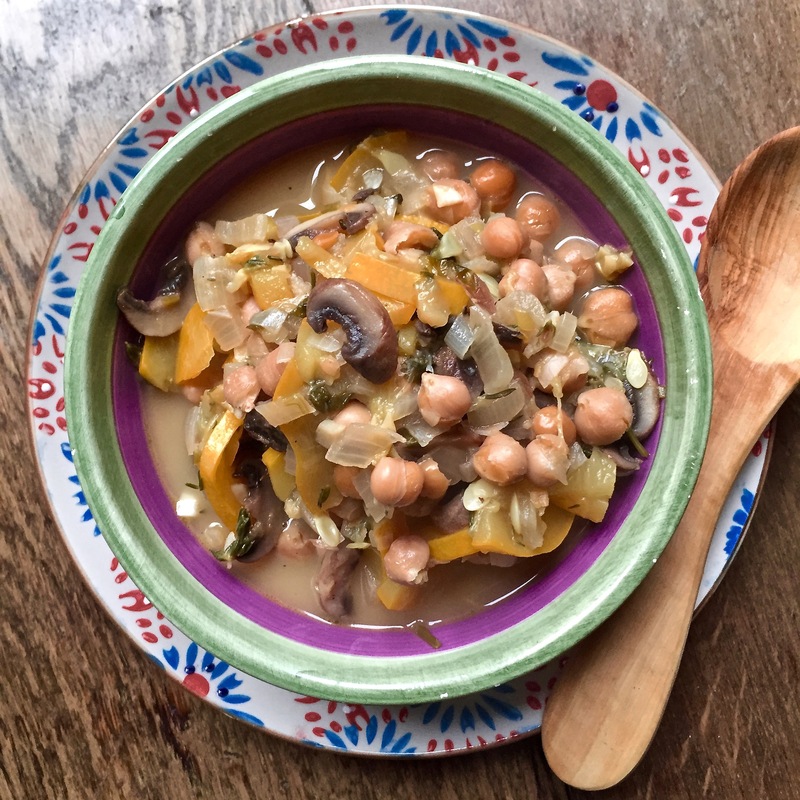 In this soup for example we have anti-inflammatory cancer fighting chickpeas and cancer inhibiting and fighting mushrooms, both of which appear on some lists as high histamine. They’re paired with a bounty of antihistamine and anti-inflammatory herbs. What makes them so? Mostly because they’re high in quercetin or luteolin, two bioflavonoids which possess antihistamine and mast cell stabilising properties. The latter means that they can prevent mast cells, an integral component of the immune system, from releasing or synthesising histamine and other inflammatory mediators like prostaglandin, leukotrienes, interleukin and many others, that then go on to wreak havoc in our body in the form of chronic inflammation. A little inflammation, or even a lot, when you’re sick, is a great thing. It helps us heal. Too much, or too much unnecessary inflammation can make us unwell. In my life so far, pairing high histamine foods to those with opposing properties, has balanced things out and is helping me heal in a way that eliminating high histamine foods and living on not so nutritious ones never did. The histamine elimination diet was a part of my life for over two years. I was told I should only be on it for four weeks, but hey, if something makes you feel better, at least at the start, you’re going to keep at it right? But eventually my safe foods started turning against me and I had to come up with a different way of looking at things. It might be different for you – we are all very different, so do whatever helps you get where you need – list or no list! CLICK HERE TO LEARN HOW TO CREATE YOUR OWN HEALING PLAN AND HISTAMINE BALANCED DIET. In a small – medium pot sauté the onions and garlic in a little oil or water till fragrant. Add in the zucchini, mushrooms, herbs and sauté a little longer. Carefully pour in some water, just enough to cover the veggies and allow them to swim about somewhat freely. You can add in some lemon here if you use it and then add in the optional items if using. Bring to the boil, add in the chickpeas and lower to a simmer for 20-30 minutes.